Every NBA Finals has stories and memories that people look back on for ever. With the San Antonio Spurs holding a 3-1 lead, the Texas team only needs one with from the final three games to clinch the title. Given their form so far, most people expect the title to be wrapped up pretty soon but as you would expect, there are some people hoping for an upset and a massive shock at this stage. One person who is hoping to create an exciting story and a little bit of history is LeBron James. He knows that no team in the modern era of NBA Finals has claimed victory after being 3-1 down but James doesn’t think it is an impossible task. On Saturday, after the Heat ran through a practice session in the hope of getting things right in Game 5, LeBron was interviewed and he made it very clear that the Heat are still in the running to clinch the Championship. “History is broken all the time” was the opening comment from James and then he proceeded to reel off a number of sporting comebacks from a variety of deficits and losing positions. Some people think that history is created to be revered and respected whereas other people think that history is made to be broke and there is no doubt that a Heat triumph would be one of the biggest stories in basketball for many years. It is still unlikely that James will take the Heat to glory but if a player had the skill and ability to do so, it would be LeBron James. There are some basketball players you can rely on when the chips are down and your team is backed up against the wall. For teams that are facing elimination, James has scored the highest number of average points (only counting players that have played a minimum of five games). 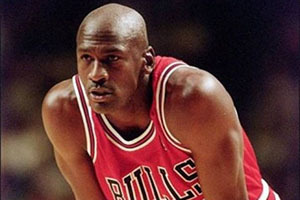 LeBron James has scored an average of 31.9 points in potential elimination games, putting him ahead of Michael Jordan, who has clocked up 31.3 points. Other big players who can be relied upon at the most difficult time include Wilt Chamberlain, who has clocked up 31.1 points, and Kevin Durant, with 30.1 points. With two Championship wins behind him, James knows what it takes to be a winner, but of course, this is going to be a different situation than what he has faced in the Finals before. Even though the Finals have been disappointing for the Heat so far, James has been the most consistent player for Miami. Up to now, he has averaged a total of 27.5 points in the four games but as you would expect, individual glory doesn’t matter much to James when the idea of the team missing out looms so large. You get the feeling that James will give everything he can, and a little bit more, in Game 5 to keep the Heat in the running but this is where he needs his team-mates to put in big performances as well. If you fancy the Heat to clinch the series in Game 5, Bwin offer odds of 1.40 to win the match while the Heat are listed at 3.00. 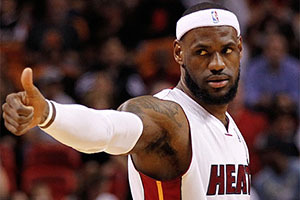 If you fancy LeBron James and the Heat to make history, odds of 10.00 are available for the Heat to clinch the series. The money line for the Spurs at Bet365 is at 1.41 while the Heat can be placed at 3.00 if you fancy them to keep the Finals alive. Keep an eye on our Odds and Lines page for the latest Game 5 odds.